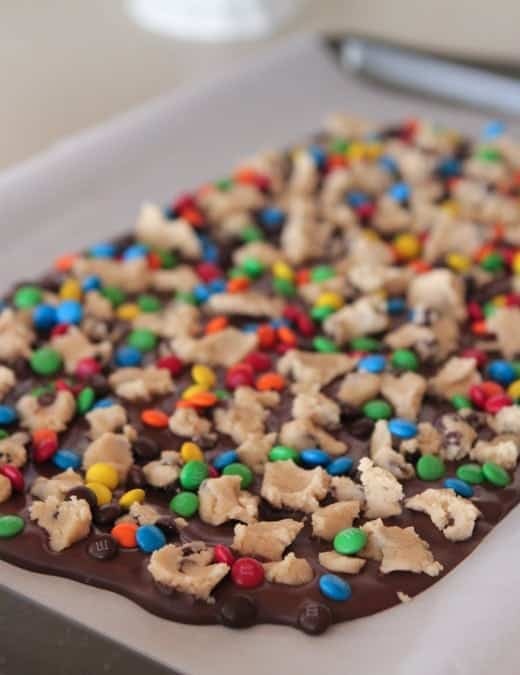 My Cookie Dough Chocolate Bark makes such a fun gift to give to family and friends this season! Chocolate and cookie dough? Love! 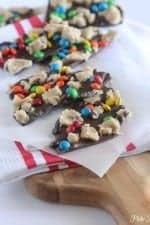 My boys and their friends were so excited to come home from school and see this colorful chocolate bark sitting on the kitchen counter. I used my crazy delicious Eggless Cookie Dough which means you get to eat it right out of the bowl with a spoon! 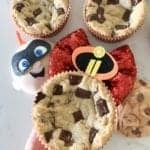 Save the leftover cookie dough for your sweet tooth craving, lol! 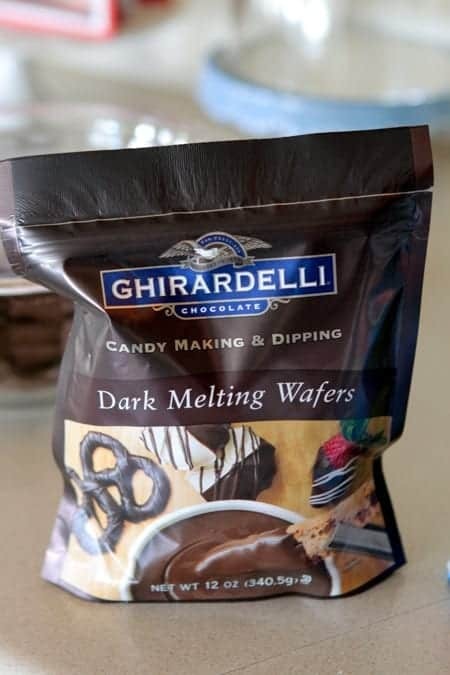 You’ve got to check out your baking section at the grocery store for these Ghirardelli melting wafers. 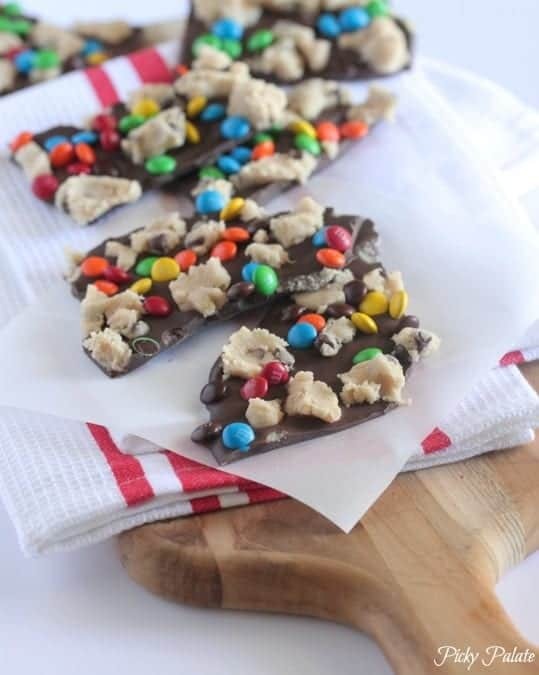 So much better tasting than the usual almond bark baking melts. 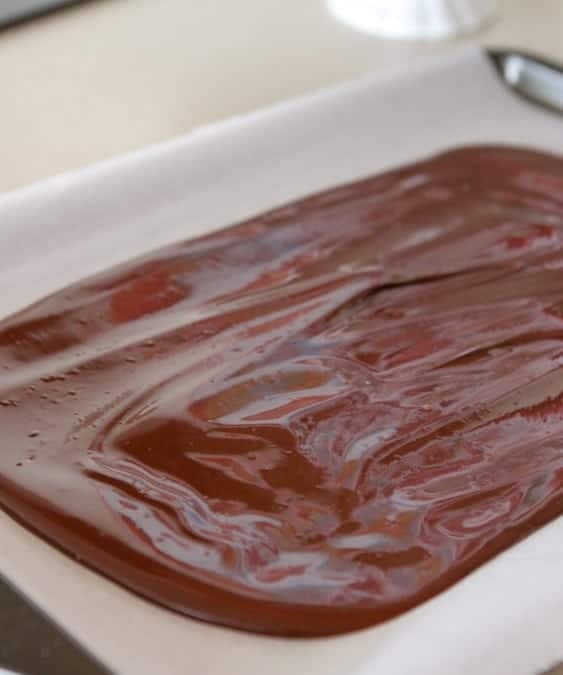 Melt your chocolate and pour right onto a parchment lined baking sheet. I didn’t go all the way to the edges. Just enough for a nice even thickness. Now the fun part. 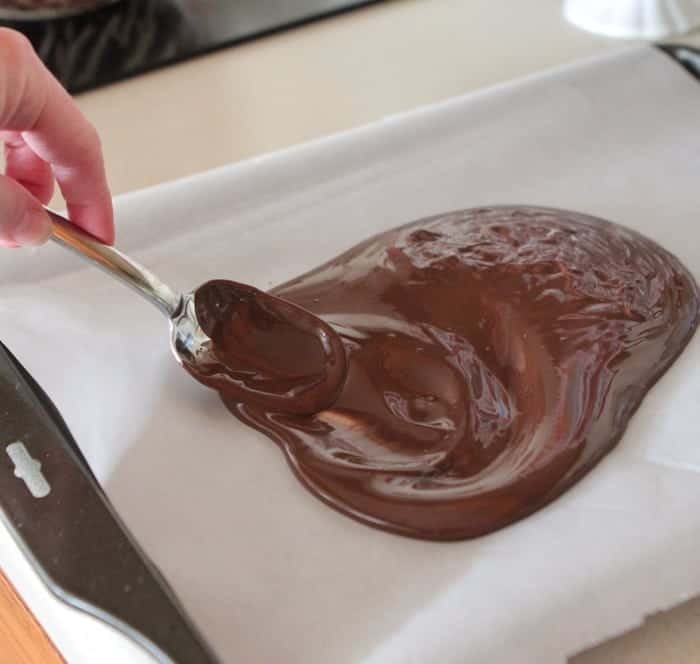 Drop little pieces of the prepared cookie dough onto the melted chocolate. Add mini M and M’s over top as well. 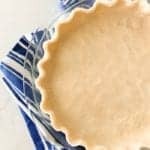 Be sure to have the kids help with this recipe. Nice and simple….and so much fun! Love packaging these up and giving to friends. Enjoy! Line a 9×11 inch baking sheet with parchment paper. 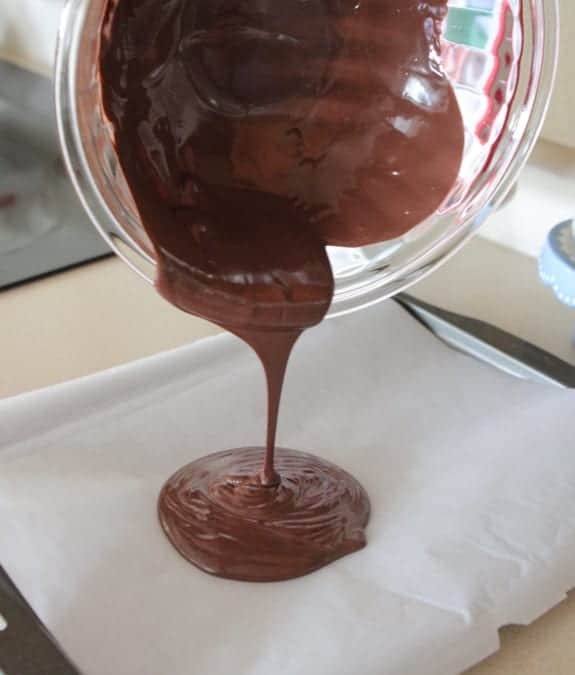 Place chocolate melts into a large heat proof bowl and microwave according to package directions. Stir until creamy and smooth. Transfer to prepared baking sheet. 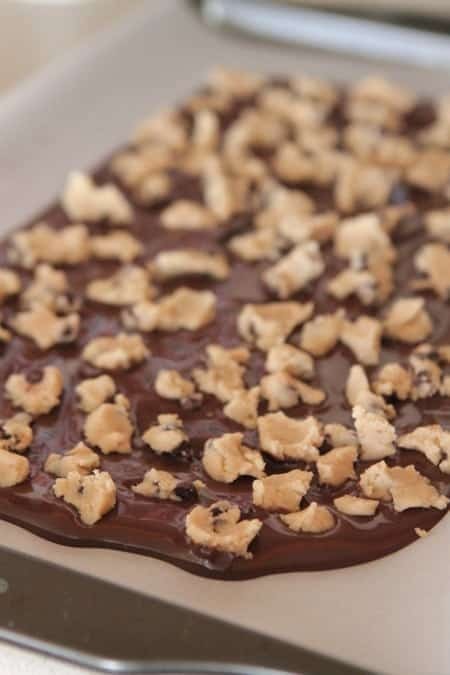 Take small pieces of prepared cookie dough and gently press into melted chocolate. 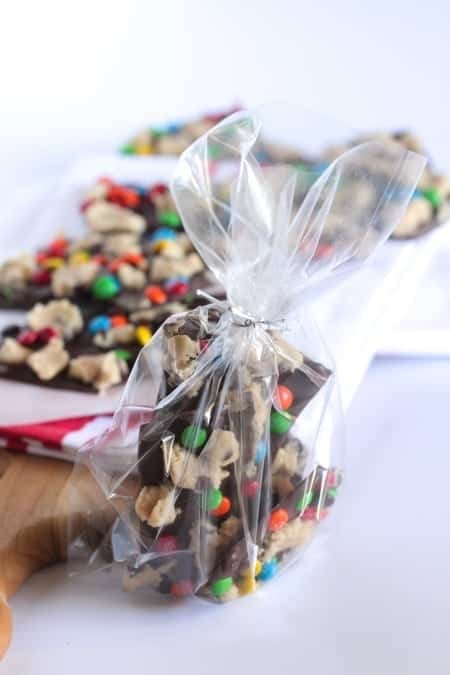 Sprinkle mini M and M’s over melted chocolate. Let set and harden for at least 30 minutes then cut or break into pieces. Serve room temperature. 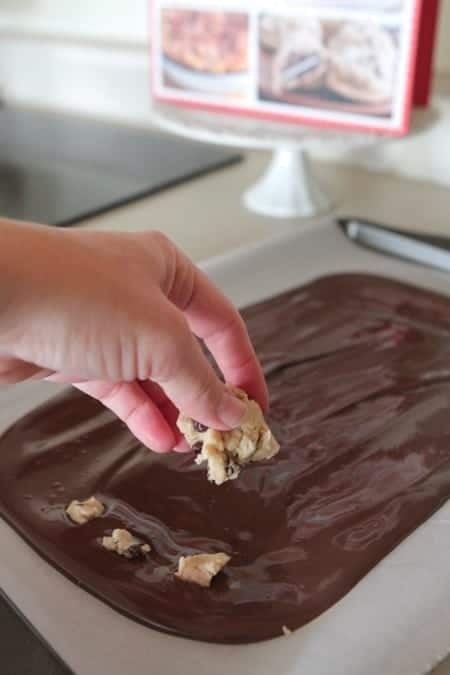 Cookie dough…..in…in…chocolate BARK!?! I think I’m in love! Love this. I actually have some eggless cookie dough frozen – I think I now know what I will do with it! This is BEYOND amazing. Yum! Fun! I would gobble all of this bark up! LOVE this!!! It looks amazing! I love making bark at Christmas time. 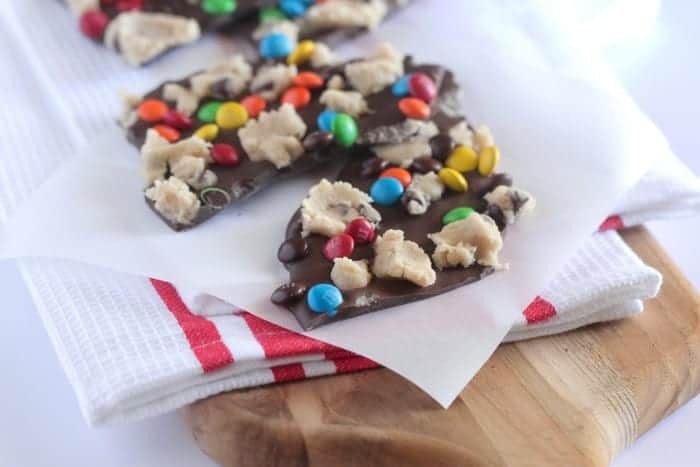 I have never tried cookie dough on bark, this sounds amazing! It is beautiful too. This is the best idea!! My kids would go crazy for this! Love this Jenny! So easy and great for gift giving. Oh, my goodness! I heart that fun colored bark too! So perfect for little gift bags! Everything about this bark looks soooo tasty!! This is so fun! I love the bright candies on top! 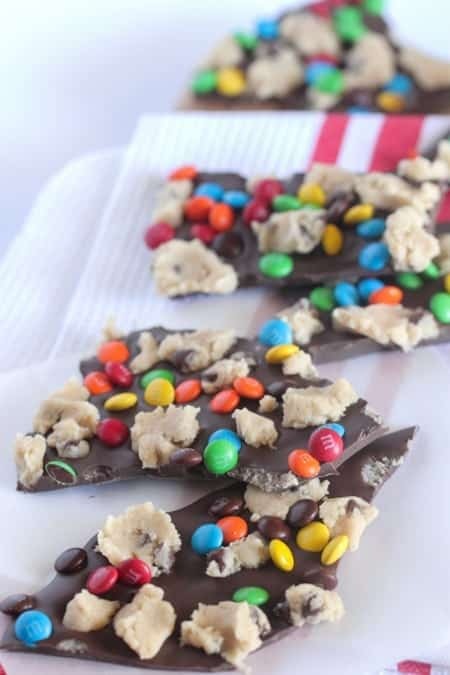 I love this recipe – so fun and colorful…and CHOCOLATE!!! I actually second this particular. Had been my very own entry web-site away from Pandora to seek out considerably better new music sites. 2 Dk Khoso hence the performer can provide the most effective tune along with continue working. The cakes look delicious and attractive, thank you for sharing.